Classic, refined, sophisticated and timeless. 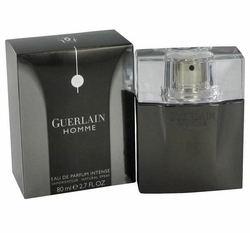 That's the Guerlain scent for the man of all seasons. Entering the Guerlain universe means crossing the threshold into an exceptional world where respect for tradition and a feel for innovation weave the most beautiful creations. Guerlain has been in existence for nearly 170 years and for a company so firmly anchored in history, the challenge has always been to reconcile the richness of tradition with a sense of innovation. When a man wears a Guerlain, he will not be ignored nor forgotten. A classic fragrance for men that will stand out from the crowd. A spicy aroma with woods and citruses and neroli that is discreet, very elegant and sophisticated. The first masculine fragrance under the direction of house perfumer Thierry Wasser, Guerlain Homme Cologne is a aromatic/citrus for men. The composition of the more intensive Guerlain seducer is also blended by the principle of dualism – human and animalistic, emphasizing at the top notes green aromas of mint, rhubarb leaf and narcotic rum. Habit Rouge is a classic fragrance for men which was launched in 2003. This is a reorchestrated version of the original fragrance from 1965.